Runaway Bay Podiatry Clinic has been servicing the northern Gold Coast area for over 20 years. We treat children.. we treat mums and dads… we treat athletes… we treat grandmas and grandpas and we can treat YOU. We have the experience to diagnose and treat all foot and lower leg pathologies. If you have a foot complaint we have the answer. Foot and leg pain can seriously effect the quality of your life. We specialise in the diagnosis of all foot and lower leg injuries and provide tailored treatment plans to suit each individual. Healthy pain free feet and legs help mobility and make everyday living something to enjoy – rather than endure. Our service is unequivocally guaranteed. You will only receive the highest standard of health care. If you are not completely happy with our service, please, please let us know. Our technology allows us to provide fast diagnosis and treatment of foot or ankle pain. Whether your condition is common or not, we have technology to help you feel better fast. Our Podiatrist has been treating Gold Coasters for over 20 years. You will have peace of mind knowing your Podiatrist has treated 1000’s of patients over 20 years and will have the experience to treat you. Same day appointments available for when you’re in pain. We promise to have an appointment available within a reasonable time frame – you will not have to wait long for an appointment. Our mission is to provide you with the best foot and ankle treatment and podiatry care available, and we stand behind our work 100%. Diagnosing and treating your foot or ankle condition quickly, efficiently, and accurately is paramount to our goals. With our advanced technologies for podiatry care, we can facilitate that for you. Heel pain is one of the most common and painful foot conditions we treat. One of the first things we will need to figure out is what’s causing your heel pain. There are a number of conditions that can cause your heels to hurt, which is why we focus first on determining the true cause of your heel pain. If the wrong cause is identified, your podiatry care and treatment could be doing more harm than good. Heel pain can be stubborn and physically draining, particularly if you are an active person or if you stand a lot for your job. Heel pain can be caused by trauma or inflammation to a number of different tissues in and around the heel. That’s why you need an experienced Podiatrist to correctly diagnose the actual cause of the heel pain and provide heel pain treatment. By far the most common cause of heel pain is PLANTAR FASCIITIS. Plantar fasciitis is the inflammation of the plantar fascia. The plantar fascia is the main stabilising soft tissue structure in your feet. weight gain: our feet are designed to carry a ‘normal’ weight. Any excess weight places great pressure on the bones, nerves, muscles and ligaments in the feet, which sooner or later will have consequences. Even pregnancy (in the last 10 weeks) can cause foot problems! Heel bursitis – inflammation of the back of the heel, the bursa (a fibrous sac full of fluid). Can be caused by landing awkwardly or hard on the heels. Can also be caused by pressure from footwear. Pain is typically felt either deep inside the heel or at the back of the heel. Sometimes the Achilles tendon may swell. As the day progresses the pain usually gets worse. Heel bumps (pump bumps) – common in teenagers. 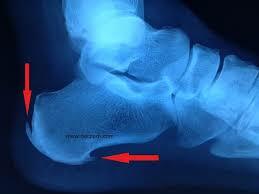 The heel bone is not yet fully mature and rubs excessively, resulting in the formation of too much bone. Often caused by having a flat foot. Among females can be caused by starting to wear high heels before the bone is fully mature. 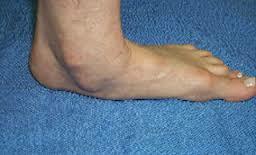 Tarsal tunnel syndrome – a large nerve in the back of the foot becomes pinched, or entrapped (compressed). This is a type of compression neuropathy that can occur either in the ankle or foot. Chronic inflammation of the heel pad – caused either by the heel pad becoming too thin, or heavy footsteps and requiring heel pain treatment. Stress fracture – this is a fracture caused by repetitive stress, commonly caused by strenuous exercise, sports or heavy manual work. Runners are particularly prone to stress fracture in the metatarsal bones of the foot. Can also be caused by osteoporosis. Severs disease (calcaneal apophysitis) – the most common cause of heel pain in child/teenage athletes, caused by overuse and repetitive microtrauma of the growth plates of the calcaneus (heel bone). Children aged from 7-15 are most commonly affected. Achilles tendonosis (degenerative tendinopathy) – also referred to as tendonitis, tendinosis and tendinopathy. A chronic (long-term) condition associated with the progressive degeneration of the Achilles tendon. Sometimes the Achilles tendon does not function properly because of multiple, minor microscopic tears of the tendon, which cannot heal and repair itself correctly – the Achilles tendon receives more tension than it can cope with and microscopic tears develop. Eventually, the tendon thickens, weakens and becomes painful. The Runaway Bay Podiatry Clinic can diagnose and isolate the cause of your foot pain and target the best treatment for a speedy recovery. Achilles tendonitis, which is tearing along your tendon that can be very painful. Your heel may hurt at the back instead of on the bottom. Plantar fasciitis involves stress or injury to a thick ligament in the bottom of your foot. The ligament can over stretch and tear, causing inflammation and pain. Bone bruises can be caused if your heel strikes a rock or another object really hard. Excessive pronation is caused when you have flat or fallen arches and your ankles begin to sag inward. This affects your gait, which in turn causes inflammation and pain in the foot. Bursitis is a soft tissue growth on your heel, which is often mistaken for a heel spur but is actually typically a neuroma or sac of fluid. Rheumatoid arthritis is a chronic condition that can cause pain in your heels or toes. Gout can also cause pain in your heels or toes. As expert podiatrists, we want to help you get back to living without heel pain. In order to accomplish this effectively and successfully, we pride ourselves on taking the time to listen to your concerns, symptoms, and treatment goals. Your podiatry care is our top priority, and we can typically help you heal without surgery. We Knock Heel Spur Pain Out…Fast! If you’re experiencing heel pain, it’s most likely because of plantar fasciitis and a possible heel spur. A heel spur is a protective, bony growth that forms on your heel oftentimes associated with plantar fasciitis. Heel pain can make every step you take painful, so it can be a massive disruption to your life. If you’re experiencing heel pain you may need x-rays to rule out a heel spur. Though many podiatrists don’t take the time to fully understand any underlying causes of your heel spur, that is not the case with us. We work collaboratively with you so that we can fully understand your condition and what the root cause of it is. Of course not every case of heel spurs are related to these conditions, we believe in creating a treatment plan based on fully and completely understanding what is causing your heel pain. We do not believe in a one-size-fits-all treatment, and understand that you are unique and worthy of a full investigation into the best way to help end your heel pain. Runaway Bay Podiatry Clinic has been dispensing custom foot orthotics from our onsite laboratory for over 20 years. We use the latest 3D scanners and printers to manufacture the correct custom orthotic for each and every individual patient. Also known as orthotic insoles, shoe inserts, or orthoses Custom Foot Orthotics are devices placed inside the shoes with the purpose of restoring our natural foot function. This is necessary when the natural biomechanical balance of our lower body has been disrupted by over-pronation. Many common complaints such as heel pain, knee pain and lower back pain are caused by poor foot biomechanics. Biomechanics is the science that studies the body’s movements during walking, running and sports. The most common form of bad foot biomechanics is over-pronation, which is the dropping of the arches and rolling inwards of the feet and ankles, and affects an estimated 70% of the population. Orthotic insoles correct over-pronation and realign the foot and ankle bones to their neutral position, restoring natural foot function. In turn, this will help alleviate problems not only in the feet, but also in other parts of the body, such as the knees, hips, and lower back.So having the correct orthotic prescribed is extremely important. Why Do We Need Custom Foot Orthotics? The fact that so many of us suffer from over-pronation due to fallen arches can be contributed to the hard, flat surfaces we walk on daily. Other factors that play a role include age, family history(genetic disposition) weak ankles, and excess body weight . As a result, over-pronation is much more prevalent in people in their fifties and older, and also in overweight persons. First of all, orthotics do a lot more than support the arches. Orthotics realign the feet and ankles, and restore deficient foot function. In addition, orthotics enable a more even weight distribution, taking pressure off sore spots (e.g. the heels, the ball of the foot, corns in between toes, and bunions). They also provide some degree of shock absorption, but this is not their main purpose. The main purpose of a custom foot orthotic insole is to improve foot function, in many cases reducing pain and preventing serious problems and injuries in the future. Runaway Bay Podiatry has an on-site orthotic laboratory so we control the entire orthotic production process. No matter what type of orthotic you require we have the materials on hand to deliver the best possible custom orthotic to our patients.We have the options of producing custom orthotics with the use of 3d scanners or using plaster moulds and we produce them all on-site! Radial Shockwave Treatment has been used to treat patients at the Runaway Bay Podiatry Clinic for over 8 years. Radial Shockwave Treatment (RWST) for feet is used to treat a range of chronic soft tissue injuries like plantar fasciitis, heel spurs and Achilles tendonitis. Radial Shockwave treatment works by sending high pressured acoustic soundwaves into the damaged tissue. The shockwaves stimulate certain cells within the tissue to initiate the cellular repair and regeneration of the damaged tissue. Typically, patients require 3-5 sessions of RSWT with 7 days between treatments. Each session takes between 8-10 minutes. What sets Radial Shockwave Treatment apart from other traditional treatments is that RSWT treats the actual damaged area at a cellular level, it stimulates the body to heal itself rather than just offering symptomatic relief. There are a number of clinical trials supporting the use of Radial Shockwave Treatment for foot pain. Please call Runaway Bay Podiatry Clinic if you would like more information on this exciting pain relieving treatment. Sometimes an ingrown toenail may actually be no big deal, but under certain circumstances, it can become a very big deal. In fact, if left untreated and allowed to grow and embed itself further into your toe, an ingrown toenail can result in a bone infection or even blood toxicity when it breaks the skin, especially if you also have toenail fungus or athlete’s foot. Both of those conditions can become life-threatening. 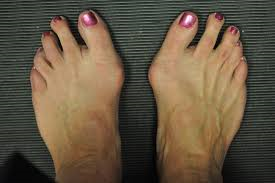 Here at Runaway Bay Podiatry clinic we can perform a permanent surgical procedure to cure persistant ingrowing toenails. This procedure is called a partial nail avulsion and is performed under local anaesthetic. We have been alleviating ingrown toenails using this method successfully for over 20 years. This risk is higher for people with diabetes, as you may have poor blood circulation or be unable to feel pain or discomfort due to peripheral neuropathy. An ingrown toenail is caused due to the pressure of the nail edge into the skin of the toe. After the nail breaks through the skin, inflammation starts. This toenail infection can result in severe pain. Ingrown toenails most commonly affect the large toes and can become a chronic recurring problem. There are several types of treatments for ingrown toenails, including: foot soaking, better fitted shoes, proper nail trimming, and surgical treatments. Call us for a consultation to determine the treatment option that fits your needs. Several medical treatments have been developed to cure chronic ingrown toenails.Our Podiatrist will discuss your needs and determine whether the ingrown toenail can be treated conservatively or if it will require a mild surgical procedure. Nail surgery is usually quite safe, with very little post-operative pain. Partial nail excision surgery can reduce the risk of recurrence caused by a regrowth of the nail. In this procedure, the Podiatrist removes the outside edge of the nail, along with the nail root. The doctor then treats the area where the nail root is located with a chemical to prevent nail growth. We perform this procedure conveniently and safely in our clinic and have been doing so for 20 years. The surgery is done using a local anesthetic, to reduce discomfort during or after the procedure. After the procedure, the Podiatrist will bandage your toe and send you home with simple post-treatment instructions. The post treatment care may include pain killers, elevation of the foot, and rest. Our Podiatrist will see you several days after the treatment to make sure that your toe is healing properly. Don’t Let Diabetes Knock You Off Your Feet! Here’s the problem. It’s very common for a diabetic to start to feel some burning or tingling in the feet. This is the early signs of nerve damage known as Diabetic Neuropathy. At first it may not seem like a big deal but with time it can progress and eventually become very bothersome. Many patients describe not being able to relax or sleep because of the burning. As it progresses it can actually become painful and eventually you can lose the feeling in your feet. Loss of feeling often means you may not feel a foot injury. You could have a tack or rock in your shoe and walk on it all day without knowing it. Often times it isn’t found out until it becomes infected. This lack of feeling can lead to a Diabetic Ulcer which is an “open sore” that forms most often on the bottom of the foot. Because of the Diabetic Neuropathy, the ulcers don’t hurt. It’s these Diabetic Ulcers that lead to amputation. It can start out by just amputation of a toe but it’s not uncommon for that to lead to amputation of a foot or leg. We suspect that many people suffer from foot pain and write it off as normal. We’re here to tell you that doesn’t have to be the case. Our podiatry clinic prides itself on being a pleasant environment whose goal is to provide the latest in podiatry care and treatment options for every foot and ankle problem. 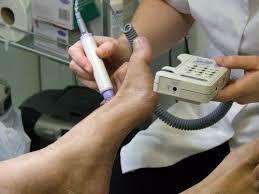 Runaway Bay Podiatry Clinic has been treating and assessing diabetic feet for over 20 years. Foot care is particularly important for people with diabetes. 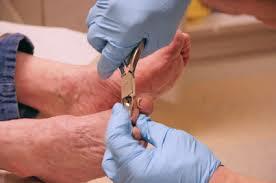 Diabetics should have their feet checked by a Podiatrist at least once a year. This is important as early detection and treatment of poor blood flow or nerve damage in the feet can prevent complications such as ulcers and gangrene from occurring. See your podiatrist or doctor if you have any of these symptoms. Department of Veteran Affairs (DVA) gold card holders are entitled to free podiatry services from private podiatrists. Treatment For Your Child’s Unique Feet. Your children are not immune to having foot problems, which is why we also treat children’s feet. Because your child is still growing, growth plates are present in the feet that make addressing foot conditions early critical to a healthy and full recovery. Even if you don’t feel like your child’s foot problem is serious, it may be more serious than you think, which makes seeing a Podiatrist crucial. Because your child’s feet are still growing, any problems that occur before the ages of 13-15 should be addressed by an expert Podiatrist. Typically, your child’s feet will stop growing between the ages of 13 and 15, so any problems that occur before this age should certainly be addressed. There are a number of conditions that can affect your child’s feet. Ingrown toenails, flat feet, growth plate inflammation, and warts are some of the most common ones. Sever’s disease – growth plate inflammation in the heel – is the most common of these conditions, especially if your child is active in sports. Typically, the complaint is about pain in the heel during and after a game or practice. Active children are also more prone to flat feet, which can often cause pain in the feet and lower legs. Many general practitioners misdiagnose this problem as simply being “growing pains,” which is why we recommend that you see a Podiatrist with your child in the event that he or she experiences any foot or ankle pain. Typically, we can find a solution for your child’s foot pain as soon as the very first visit. For a condition such as flat feet, your child may simply need custom orthotics to support their feet. Your child’s feet are unique and still growing, so allow us to help you by getting your child back to the activities he or she loves to do without the pain of having a foot condition. Your feet play an important role in most sports, take good care of them. Improving your athletic performance is a complicated puzzle with many parts. A Podiatrist may not be the first thing to come to your mind, BUT we have the answers that can help you if you’re experiencing any kind of foot or ankle pain that hinders your athletic ability. If so, you’re in the right place. Too often we see patients who have had their ankle sprains treated by another Podiatrist but are still in pain. Unfortunately, ineffective and costly treatments can sometimes make a condition worse or cause problems that are not always reversible. When your injured ankle isn’t treated properly and in a timely manner, it can heal itself in a way that may cause instability, limited mobility, and increase your likelihood of future sprained ankles. Timing is everything when treating a sprained ankle injury, so the sooner you see a podiatrist the sooner you can get back to your life and doing what you love. Common Sports Injuries Treated at Runaway Bay Podiatry Clinic. Visiting a podiatrist at Runaway Bay Podiatry clinic should be your first step towards getting back on your feet after a sports injury.We can not only help treat your current foot or ankle pain, but provide you with helpful tips to prevent future sports injuries. Fungal toenail infections affect about 10% of the population. Toenail fungus and athlete’s foot are actually caused by the same type of fungus. Toenail fungus usually begins as a small spot under your nail and slowly but surely affects your entire nail. As it spreads, toenail fungus begins to make your toenails thicken and discoloured. This fungal infection can spread to your skin or fingernails, although fungus on the fingernails is pretty uncommon. Toenail fungus often thrives because your feet provide a warm, dark, and often damp environment. Don’t Let Itchy Athlete’s Foot Hold You Back! Pain on your skin or in your foot. Rashes, dryness, or peeling. Burning or stinging sensation. Blisters, infection, swelling, or itching. If you have diabetes, it’s important to see a podiatrist as soon as possible when you experience any condition involving your feet. If you have diabetes, your risk of a small problem like toenail fungus becoming a big problem increases due to poor circulation. Toenail fungus is one of those conditions that could be shrugged off as “no big deal,” but in extreme cases or if coupled with another condition such as an ingrown toenail, it could become a huge issue and lead to a skin infection, blood poisoning, or an infection in your bone. When You Should Seek Help From A Podiatrist for Flat Feet. If you experience foot pain on a regular basis or have any of the listed symptoms consistently, then it may be time to see a Podiatrist. You shouldn’t have to live with foot pain, we’ve helped thousands of people with flat feet get back to their lives fast. Tired or achy feet after you stand or play sports. Pain in your lower legs. Obviously different conditions will require specific therapy. This may involve exercises, mobilisation, manipulation, massage, footwear advice an/or postural balance programs. At birth it is normal for a child to have very flat feet. As the child grows older the arch should usually develop. If the arch hasn’t developed by age 5 or 6, they should be assessed by a podiatrist. They may not require treatment at this stage but it is important to monitor and assess them if you have any concerns. At Runaway Bay Podiatry Clinic we treat all types of foot conditions. Sometimes its just difficult to bend down to tend to your own feet because of back pain or arthritis. Whether it be painful corns or callous, thickened toenails, fungal skin or toenail infections if your feet require some general attention give the Runaway Bay Podiatry Clinic a call. A podiatrist (commonly referred to as a foot doctor) is not a doctor as such but rather an expert in caring for your feet, with special skills focusing on the maintenance and treatment of skin, nails conditions of the feet and ankles. Regular treatment by a podiatrist (also formerly known as a chiropodist) can help prevent many common painful lesions such as ingrown toenails and other nail problems, corns, toenail fungus, callouses and cracked heels. Self-treatment can often turn a minor problem into a major one and is generally not advisable. Blisters are foot problems that we have all had at some point in our lives! They are caused by heat, moisture, skin friction or excessive pressure – or a combination of all! 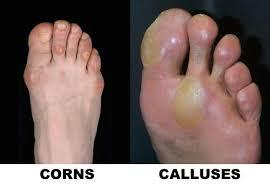 Corns and calluses are protective layers of compacted, dead skin cells. They are caused by repeated friction and pressure from skin rubbing against bony areas or against an irregularity in a shoe. Cracked heels is when the skin around the heel becomes dry, it loses it’s suppleness and elasticity and often begins to split. Foot odour results from excessive perspiration (sweaty feet) from the more than 250,000 sweat glands in the foot. Daily hygiene is essential. Warts are caused by a virus, which can enter the skin through small cuts and cause significant foot pain. There is a variety of footcare option for plantar warts which will depend of a number of individual factors which your podiatrist will best educate you on. Get Treatment & Relief For Your Bunions … Fast! You may have heard some negative things from people when talking about seeking treatment for your bunions. People may have told you that bunion surgery doesn’t work or even makes the pain worse, and this comes from the past experiences of people who may have had bunion surgery performed a long time ago or by a doctor who wasn’t an expert. If you find yourself feeling nervous about seeking treatment for your bunions because you’ve heard those kinds of statements, you’re certainly not alone. You should only trust an expert foot surgeon to perform bunion surgery successfully, and unfortunately the horror stories are often born because of the surgeon, not because of the surgery itself. Of course it’s always best to develop a custom treatment plan for your bunions based on your unique situation and needs, which is why we take a consultative approach. It’s important that your Podiatrist takes the time to get to know your feet and your unique condition with you so that you can come up with the best possible treatment plan together. 3D Scanning: 3D scanning is used here at Runaway Bay Podiatry in order to provide an accurate and high quality scan of your feet. 3D Printing: A professional desktop 3D printer is used to print out the digital model of foot orthotics. Radial Shock Wave Therapy: Runaway Bay Podiatry is a leader in the application of Radial Shockwave Therapy. We are proud to introduce a 3D printed custom sandal, the first of this kind! Our 3D printed custom sandal is created by using a full-length 3D printed custom midsole, outsole and conventional sandal uppers. These sandals can be fully prescribed for various foot conditions, such as plantar fasciitis, flatfoot, bunions, pes cavus, hallux limitus and leg length discrepancy. Pain reduction – by changing the way the nerves signal pain. Increased tissue healing – radial shock waves cause the release of chemicals in the cells which can reduce inflammation and pain. Improved blood flow – repeated shock waves create new blood flow promoting tissue healing and regeneration. Activates healing: Starts the healing process triggered by stem cells activation. The treatment stimulates and effectively supports the body’s self-healing mechanisms 100% applied without medication. After the very first treatment it is usual to experience immediate pain relief!